Gingivitis is the start of gum disease. Research shows that up to fifty percent of Americans have gingivitis. Gingivitis is characterized by red and swollen gum tissue that bleeds easily. Also, the gum tissue may be tender to the touch. If treated early, gingivitis can be easily treated and the gum tissue will return to a health state. When gingivitis is not treated a condition called periodontal disease will occur. 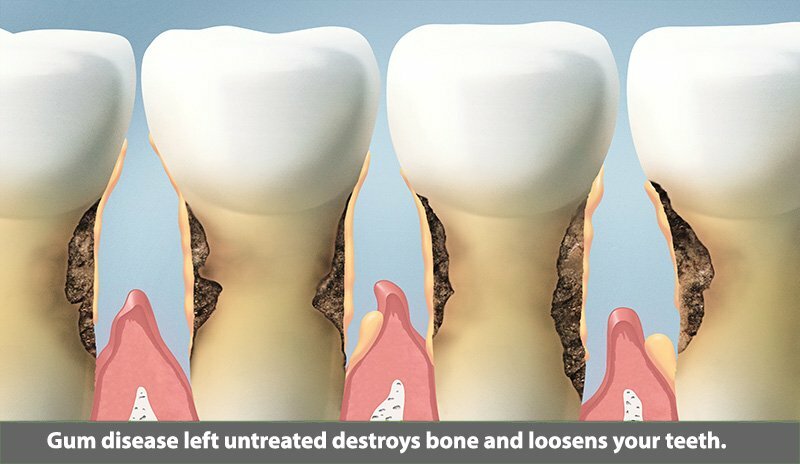 Periodontal disease will destroy gum tissue along with the ligaments and bone tissue around teeth. Periodontal is the number one reason that people lose all their teeth. Periodontal disease causes patients to lose teeth because the tooth’s foundation (gum tissue and bone) is destroyed and noting is left to hold the tooth in place. Unfortunately, this devastating disease can cause widespread damage with only nominal pain or discomfort. The bacteria infection in your mouth causes chronic term inflammation and elevated immune system activation. The bacteria in the gum tissue (and their toxins) can spread throughout the body and cause organ problems. Furthermore, research shows gum disease is associated with diabetes, stroke, heart disease and pre-term pregnancies. To fight this dental infection your hygienist will perform a non surgical procedure called scaling and root planning. This is the process of mechanically removing the infection, plaque, and calculus (tartar) from the teeth. Regular dental cleanings and good home care are vital to a mouth. Regular cleaning They provide healthy bone and gums which give your teeth a strong foundation. Get your gum tissue in order with quality dental care. Call our office at 713-941-8261 or visit us at 3421 Burke Rd Ste A, Pasadena, Texas 77504.